Joe Girardi has made his first tough decision of the postseason, and it isn't going over well with his former protégé Jorge Posada. Girardi announced that A.J. Burnett, who will start Game 2 on Friday, will pitch to Jose Molina rather than Posada. Jorge wasn't thrilled. "I just hope we win that game," Posada said, setting up the inevitable "I told you so" should they lose. 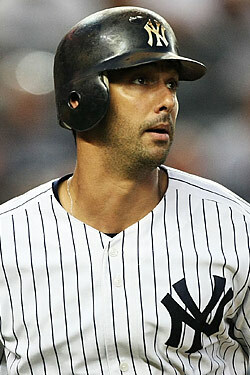 But while we don't blame Posada for wanting to play, we're fine with Girardi's decision. We'd rather the Yankees not pretend Burnett is better off pitching to Posada when the numbers dispute it, just because he's Jorge Posada and he's a champion. Sure, you want to win with your best players or go down trying, but in this scenario, Posada's not your best player. Simply put, Burnett pitched better to Molina this year: He struck out 79 of the 434 batters he faced in sixteen games with Posada behind the plate, and 77 of 288 batters in eleven games with Molina there. Opponents batted .270 with Posada catching, and .221 with Molina catching. Their OPS was .775 with Posada, and .658 with Molina. That's a big enough advantage to make up for Posada being out of the lineup should Girardi decide not to DH him. (As of this morning, Francisco Cervelli was still in the mix for an ALDS roster spot, which would allow them flexibility.) It's also worth noting that Posada has hit a couple of big pinch-hit home runs this year. In general, we think it's smart not to tinker with your regular-season formula too much in the playoffs. Pitching on three days' rest, for example, or using career starters out of the bullpen should be a last resort in a do-or-die situation. That's not what they're doing here. Molina caught plenty of Burnett's games this season, and though Posada's the True Yankee, they're better off trusting the numbers.